Hope you all had an amazing Holiday weekend and had lots of good yummy pie!!! My weekend was so relaxing and wonderful! I loved it! 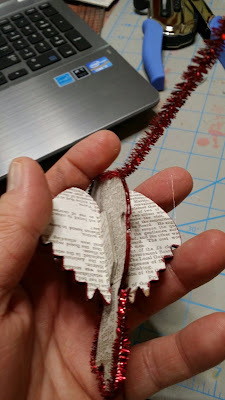 I wrote on Facebook, sometime this weekend, that I was having a blast pulling things out I never used before and giving them a go. So much fun! It's so nice to have the time to do that! So I am very thankful indeed! 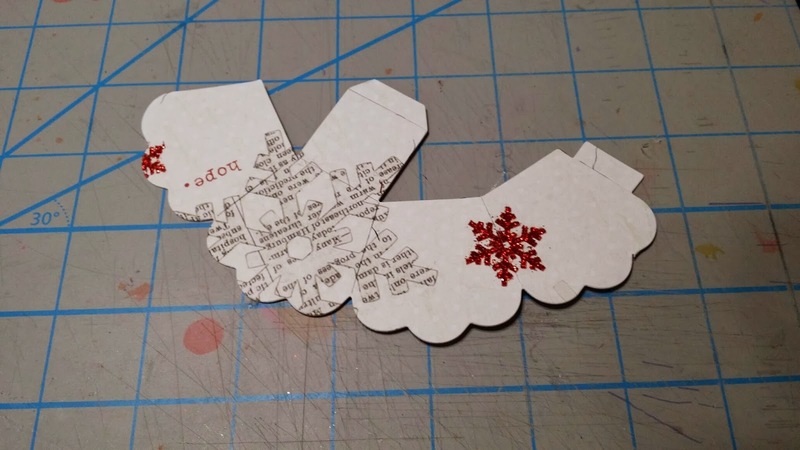 One of those very things was a die from Eileen Hull/Sizzix...Bird. I love this little bird! 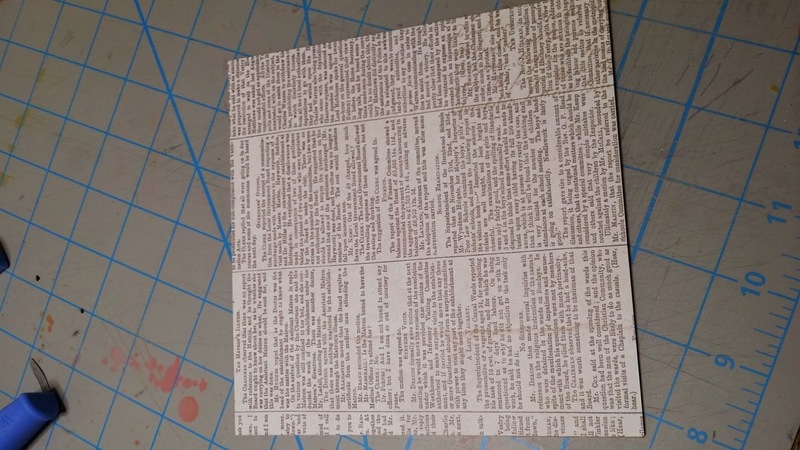 I took some of Theresa Collins Christmas paper and adhered it to the front and back of chipboard. I then cut the Sizzix Bird die. 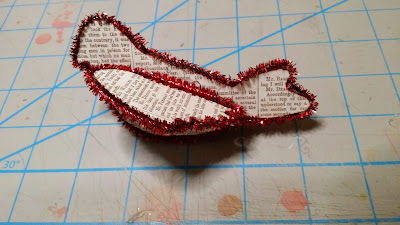 I glued some red chenille stems around the edge of the bird and it's wings. I added an eye with red bling from my stash and then thought the little guy...or girl...needed a crown! Next, it was time to punch some holes. 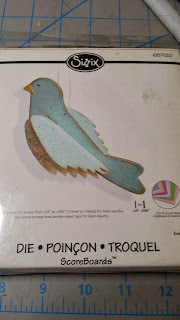 I punched a hole in the top of the bird to add a string hanger. One hole was punched on the bottom to add a jump ring to hang the basket from and last a hole was punched on his tail feathers. 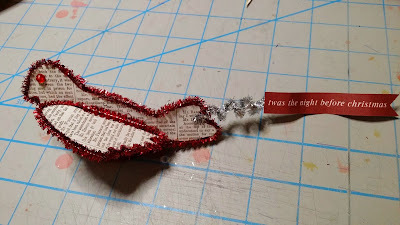 From this hole, I added a silver chenille stem, curled it around a pencil and added a Theresa Collins pull out banner from her Christmas collection. 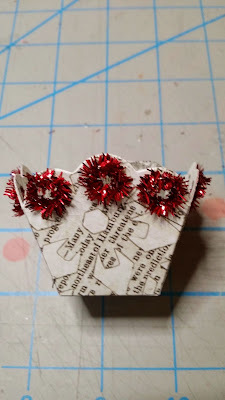 Now it was time to work on the basket...I cut the Candy Cup die from double backed Theresa Collins Christmas paper. I punched 1/4-inch holes around each of the scallops. 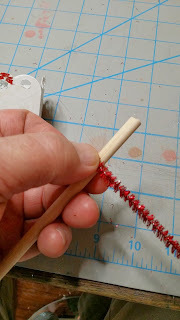 I took some of the red chenille stems and bent them around a dowel to form little circles. Once they were cut, I adhered them to each of the1/4-inch punch outs on the Candy Cup. I took (4) Silver Chenille stems and placed them through each of the middle holes on the basket and bent then together at the base to secure. 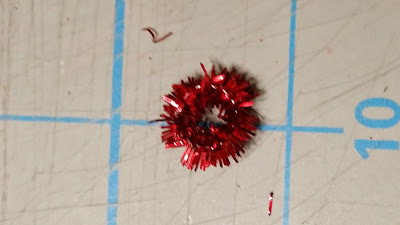 I pulled the (4) stems up at the top and twisted them together and made a loop to hang from the bird via the jump ring. 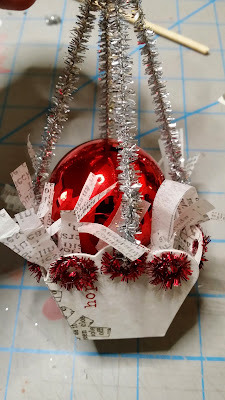 Next, I cut some strips of Tim Holtz Tissue Paper and add it to the basket for filler and placed a small ornament into the basket. 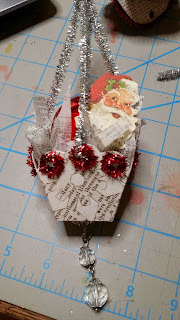 Last, I added a Santa face to the ornament to make it look like he's peering out from the basket. 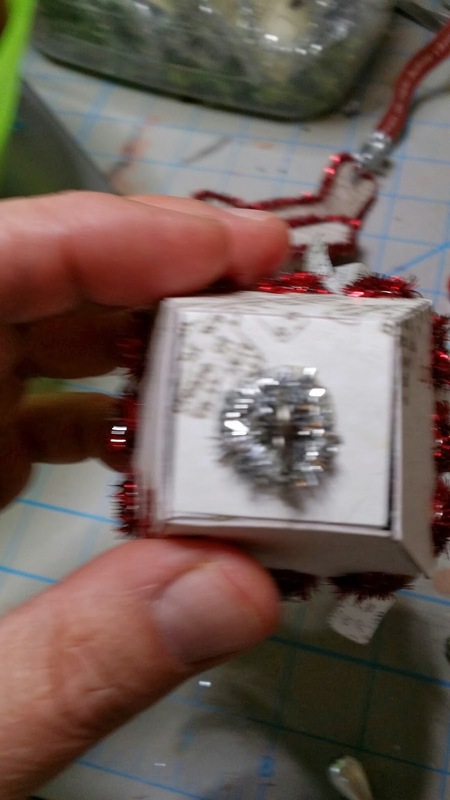 If you care for a dangle off the bottom, I glued a Tim Holtz Ring Fastener to the bottom of the basket, added some silver Chenille to hide the fastener and dangled some beads from the ring. Really really cute. I have had that die for some time and have never used it either! Now you are going to make me pull it out! That little bird is so cute! 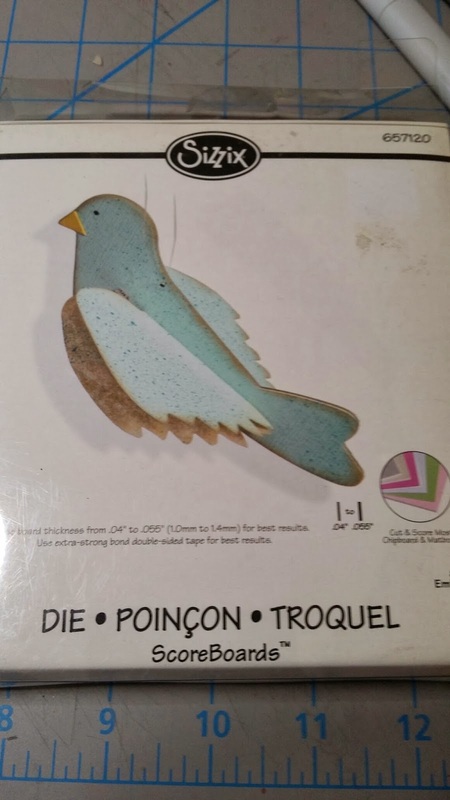 You have just reminded me that I have Tim's Sizzix bird, but haven't used it yet either. We must all have lonely birds nesting in our studios! Wonder how many of us have unused dies, and other bits and pieces! very sweet decorations Jim. 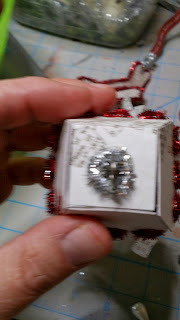 Fun ornament! 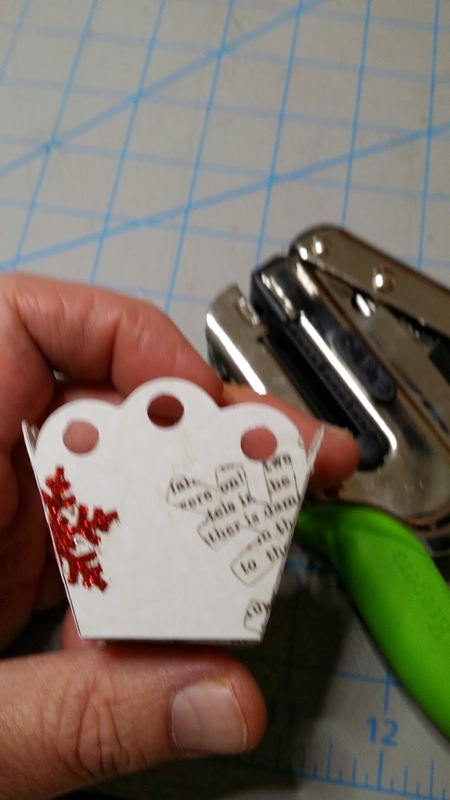 You have inspired me to take my dies out and look at them in new ways. Thanks for spreading the Christmas spirit. Jim, I haven't been able to comment while I was away...Google was acting up for me because I was in a different state. Anyway, I wanted you to know that I've loved all your sweet vintage ornaments and the tutorials. I think the top hat you made last week was brilliant and like the way you turned it into a true Gentleman Crafter steampunk chapeau. This is an absolutely adorable ornament! One day I would love to sit and watch you while picking your brain. Where in the world do you come up with all of these idea's and How do you find the time to do all of them? Hugs!!! It's a Graphic 45 Kinda Day!